Capture sharp and natural 4K images internally in Cinema RAW Light, MP4 or XF-AVC formats, recording to CFast 2.0™ or SD cards respectively; additionally, shoot 120P slow-motion in Full HD, making the EOS C200 suitable for a variety of productions. Record easy to ingest XF-AVC* or MP4 files to low cost SD cards, with up to 13-stops of dynamic range. A high resolution (1920x1080) OLED electronic viewfinder with a wide colour gamut and multiple controls. Use with the EVF-V70 when attaching to the EOS C200. The 50cm UN-5 cable and 100cm UN-10 cable connect the camera to Canon’s LCD screen or EVF. A dedicated shoulder support with 15mm rods and features a split sliding shoulder pad for added comfort. A rod clamp that can be mounted onto the camera/handle, allowing the operator to use a 15mm rod for additional rigging purposes. 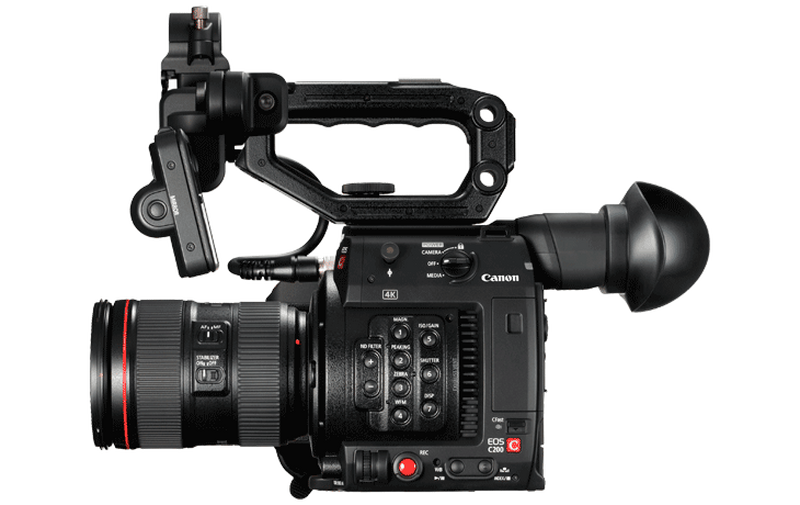 The RC-V100 offers cine camera users more freedom. Enjoy remote control of almost any camera function. The GP-E2 features an electronic compass and GPS signal receiver to record time, longitude, latitude and elevation directly into the metadata of every shot. A lens mount service option offers the capability to change the 4K digital cinema camera’s original EF Mount to a PL mount and back again. This service enables users with specific requirements for mounting the C200 onto a drone or gimbal to remove the EVF for extra clearance at the rear. A professional Full HD video production camera with an accurate and reliable autofocus system supporting interchangeable lenses. A highly creative production tool that captures 4K/Full HD video with up to 15-stops of dynamic range.